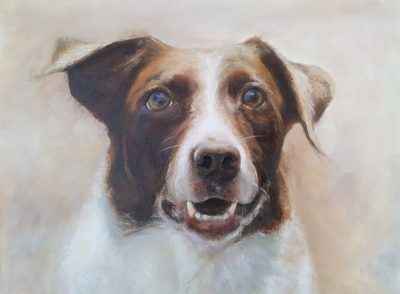 Dog portrait painting in oils of Del. I adored painting both Del despite the grimace from arty friends who think painting a pet portrait is some sort of artistic sin! 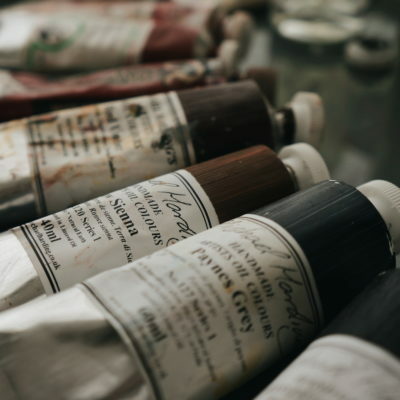 Fortunately, every painting can present an opportunity to learn and grow, and for me, there were several lessons available: edges and the balance and use of warm and cool colours in the form of classic complementaries. There is a timeless beauty in the combination of opposites. A double act that entertains as well as informs. The opposites performing here were the beautifully rich burnt sienna and in comparison, cool, ultramarine blue. Both of these are hugely versatile pigments, transparent in character and when combined, creating a wonderful range of either warm or cool darks which are ideal for shadows. Edges, hard, soft, lost, they communicate so much and are an essential part of creating believable form and in this case form and fur. Edges are a great tool for directing composition too. You can see my soft edges on Del’s body fur to help receded it and the more defined edges of his muzzle to bring it forward and to focus your attention on his face. What a beautiful Dog portrait. I’ve been looking on the internet and so many are plastic looking and they’re really expensive. I have a Labrador called Honey and have been looking for someone to paint a portrait of her. Have you painted a Labrador portrait before? 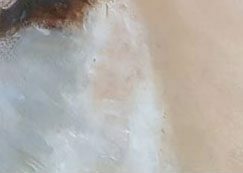 Do you do commissions for dog portraits?